A- Asymmetry, One half unlike the other half . B- Border Irregular, scalloped or poorly defined border. C-Color, Varied from one area to another: shades of tan and brown , black: sometimes white, red or blue. D- Diameter, While melanomas are usually greater than 6mm in diameter(the size of an eraser) when diagnosed, they can be smaller. If you notice a mole that is different from others, or which changes, itches or bleeds (even if it is small) you should see a dermatologist. E- Evolve, If you see your mole changes in any way over a period of time contact a dermatologist. Malignant Melanoma is the most deadly of all skin cancers. Every year an estimated 7,700 Americans will die from Melanoma. It is projected that more than 46,000 Americans will develop Melanoma annually. Melanoma begins in melanocytes, the skin cells that produce dark protective pigment called melanin which makes the skin tan. Since melanoma cells usually continue to produce melanin, the cancer appears in mixed shades of tan,brown,and black although it can be red and white. Melanoma can metastasize or (spread) , making treatment essential. Melanoma may appear suddenly or begin in or near a mole, or another dark spot in the skin. It is important to know the location and appearance of the moles on the body to detect changes early Any changing mole must be examined by a dermatologist. Early Melanoma can be removed while in the curable stage with a 95% cure rate. Excessive sun exposure, with or without a sunburn, is the most important preventable cause of Melanoma. Light-skinned individuals are also at particular risk including red heads and blondes. Heredity also plays apart. A person has an increased chance of developing Melanoma if a relative or close family member has had Melanoma. Atypical moles (dysplastic nevi), which may run in families, and a large number of moles more than 50, can serve as markers for people at increased risk for developing Melanoma. Dark skin is not a guarantee against Melanoma. People with darker skin color can develop melanoma, especially on the palms, soles, under the nails, mouth and in between fingers and toes. *Click on the toolbar at the top of the page to view how to do a self- examination as well as what to look for when examining. 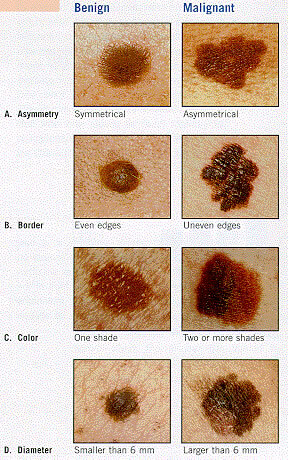 PLEASE NOTE: MY MELANOMA DID NOT LOOK LIKE ANY OF THESE DARK MOLES ABOVE. MINE WAS LIGHT BROWN AND CHANGED TO AN OVAL AND BECAME LARGER OVER TIME. THIS YEAR MORE THAN ONE MILLION PEOPLE WILL BE DIAGNOSED WITH SOME FORM OF SKIN CANCER. TAKE CARE OF YOURSELF AND LET IT NOT BE YOU.